The front section of bone and all the teeth are removable, one incisor is longitudinally sectioned. Nerves, blood vessels, the sublingual and submandibular glands are shown. These diseased teeth show various stages of caries from a small and easy-to-treat example on an incisor, through to advanced degradation of a molar, showing exposed root. 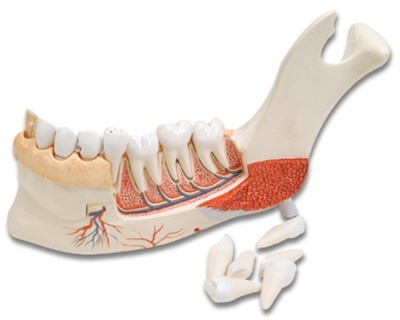 Using this model it is simple to explain the necessity for good tooth care. Made in Germany by 3BScientific.